The Bars to Go group of companies has launched its first bartending and mixology scholarship valued at almost $120, 000. The lucky student will also receive a professional bartending kit courtesy of Smirnoff, a gift basket from Tru- Juice, a cellular phone from Digicel and at the end of the course at the Bars to Go Training Institute, they would have received a certificate in advanced bartending. This certificate makes the scholarship winner and other students qualified to work not only in Jamaica, but anywhere in the CARICOM region and England. "It is critical that we cultivate the very best bartenders for our industry. Jamaica is a destination for many countries and when our visitors order a drink they expect it to taste the same way no matter where they go. Our aim is to train our bartenders to be consistent, but also to open up their horizons to the possibilities. Using the freshest ingredients has always made the difference between a 'cocktail' and an 'experience'", said McHugh. She added, "With our international expertise and the versatility of Tru-Juice premium quality juices, the options are endless. We are thrilled to have them on board as partners with us in this training initiative." The signing of a million-dollar contract with Tru-Juice signifies that the standard for Jamaican mixed drinks will be raised for years to come. From the contribution of classroom materials to provisions of products for training, Tru-Juice premium quality juices has shown their commitment to the advancement of our local bartenders who will one day work in the hotel and nightclub industry. "Jamaicans have such a vibrant appetite for flavours, colours and textures. Our food has gone far to bring Jamaica to the forefront of our visitors hearts and minds. By giving the bartending industry the tools to create the finest drink mixes we anticipate great strides in a growing cocktail/mixed drink culture. One great Jamaican company with another, the synergy is magnetic," said Kim Lee, head of marketing - Trade Winds Citrus. Patrice McHugh, Managing Director of the Bars To Go Group of Companies was recently selected to appear in a cocktail booklet alongside the world's leading mixologists. The book, which is called the 'Don Julio Luxury Booklet', will be released in February 2010 and the world's top mixologists were asked to submit a recipe using Don Julio as the base spirit in addition to fresh ingredients. In addition, the drink is to be accompanied by a ritual. Case in point, the known way to drink tequila is with salt, then sucking on lime. Wanting to step away from the usual way of drinking tequila, each mixologist's recipe and ritual is sure to be a hit with tequila fans. Patrice's Don Julio recipe incorporated the use of fresh tangerine juice, ginger juice, Agave syrup and Don Julio Reposado tequila. The finished product is called the 'Reposado Lightening', while her ritual celebrates Jamaica's achievements and spirit. The ritual starts by imitating the world's fastest man, Usain Bolt, by quickly running on spot for 9.58 seconds, after which, do Bolt's signature 'lightening pose'. Then quickly drink the Reposado Lightening. After drinking, quickly run on spot for another 9.58 seconds then do the 'lightening pose'. It's going to be an undeniable hit among party-goers, bar-hoppers, college fraternities and more across the world. Patrice said, "When they contacted me I was in shock but excited. It has been a long journey getting to this point, so for an international brand to recognize your hard work in the field it's quite exciting but at the same time extremely humbling. Also, with the drink, I wanted people across the world to recognize Jamaica for our achievements, our energetic spirit and associate it with someone who is internationally known for being just as vibrant. So I immediately thought of Usain and his energy. I think it will be a great mix, so to speak, when the book is released in two months and persons start doing the ritual." Other international mixologists to be featured in the booklet include: international spirits and cocktail wizard, Gary Regan who is known for his books, "The Bartender's Bible", "New Classic Cocktails", "The Joy Of Mixology", "The Martini Companion: A Connoisseur's Guide" and many more, and Dale Degroff, an unparalleled authority and a much sought after expert in the industry and universally acknowledged as the "King Of Cocktails". His books include: "The Essential Cocktail: The Art of Mixing Perfect Drinks", "The Bar and Beverage Book", "The Craft Of Cocktail: Everything You Need To Know To Be A Master" and more. In The Mix -- "The World Record and Sunset Glaze"
This week's 'In the Mix' column features two new mixes, World Record and the Sunset Glaze, with STAR columnist and managing director of the Bars to Go Group of Companies, Patrice McHugh. I'm sure most of us saw the recent news with the Honourable Usain Bolt naming a baby cheetah 'Lightning Bolt', so did my students here at the bars to Go Institute. So in honour of the fastest man alive, one of my students Shawn Watson came up with a superb mix called the 'World Record' that is sure to knock your socks off! The other, Naomi Forrest came up with the 'Sunset Glaze' and as the name suggests, it's quite a relaxing way to end your day! Preparation: Place all ingredients in a shaker, add ice and shake well. Pour mixture into a martini glass. Preparation: Place all ingredients in a shaker, add ice and shake well. Pour into a martini glass. So what are you waiting for? No matter the mood, either Naomi or Shawn's drink mix is sure to be a perfect addition to your day. You'll love it! Until next time friends! Email me at Inthemixcolumn@gmail.com. In The Mix -- "The Heavenly Splash"
Kim Lee, brand PR manager at Red Stripe stopped by the Bars To Go Training Institute and did a class on the topic of 'Drinking Responsibly'. This week's 'In the Mix' column features a new mix, the Heavenly Splash, with STAR columnist and managing director of the Bars to Go Group of Companies, Patrice McHugh. Yesterday, Kim Lee, brand PR manager and responsible drinking champion at Red Stripe stopped by the Bars To Go Training Institute and did a class on the topic of 'Drinking Responsibly'. In bartending, not only is it important to know what to serve, but it is also necessary to promote a healthy drinking lifestyle to your clients/patrons. After the class, a student, Shawn Watson, catered to us with his special mix, Heavenly Splash. It's the perfect way to introduce the holiday season. Join us next week as we kick-start great drink mixes for the holiday season. Place all ingredients into a mixer, shake and pour into a martini glass. Go ahead and indulge! Shawn's drink mix! It's the perfect kind of drink to give you a little heaven here on earth. You'll love it! Until next time friends! Email me at Inthemixcolumn@gmail.com. Shawn Watson catered with his special mix, Heavenly Splash. 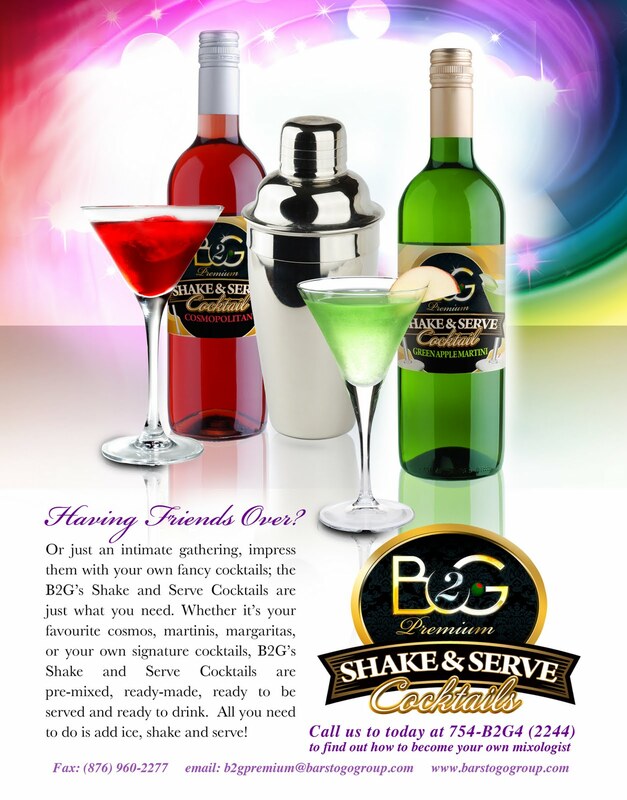 B2G Premium Launches The "Shake & Serve Cocktail"
B2G Premium Beverage and Catering Solutions Ltd. has launched their one-of-a-kind 'Shake & Serve Cocktails'. The upscale company which caters to the chicest entertainment events decided to up the ante and launch the new venture because, quite simply, they saw it as a necessity. 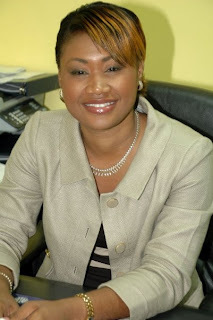 According to Managing Director of the company, Mrs. Patrice Wilson-McHugh, "Always hiring persons to mix seemingly difficult cocktails should be a thing of the past. It's so much easier to do it yourself if it's just a low-key get-together with friends or a quick lyme. As a result B2G Premium decided to once again cater to our great clientele and give them great cocktails without the hassle. The 'Shake & Serve Cocktails' distributed by B2G Premium, is as simple as it sounds: all they need to do is literally open the add ice, shake, then serve." B2G Premium, a subsidiary of the Bars to Go Group of Companies - also home to Bars to Go, Gourmet to Go and the Bars to Go Training Institute - was formed earlier this year to cater to the island's most intimate and, as the name suggests, premium events. In addition, Mrs. Wilson-McHugh added, "B2G Premium only recruits and trains the most professional and experienced bartenders, mixologists, chefs and waiters; individuals who bring knowledge, enthusiasm and personality to the ever-growing cocktail, catering and event world. In addition, we execute events across Jamaica with the utmost professionalism and precision . So it shouldn't be surprising that we would add something as exquisite as the 'Shake and Serve Cocktails' to our portfolio to further cater to our clients." Patrice McHugh is "In The Mix !" This week's 'In the Mix' column features two new mixes, the Halloween Tambary and Love Spell 36, with STAR columnist and managing director of the Bars to Go Group of Companies, Patrice McHugh. Halloween is on the horizon and of course my students at the Bars to Go Training School have Halloween treats up their sleeves too. Many think Halloween is just about the costumes, but it's not. What if you go to a party, whether at your house or to a club, the decor is great, but the liquor tastes awful? Then, that's certainly not a treat. So one student, Kevin Kelly came up with the Halloween Tambary while another, Nathaniel Williams came up with the Love Spell 36. They sound intriguing right? They taste even better! Take it from me, they are great and are for the young at heart and adventurous. Give in to the adventure... after all, it is bewitchingly tasty. Nathaniel Williams' Love Spell 36.